Shirley Valentine is one of my favorite movies of all time. I watched it again last night, and, as always, came away from it feeling uplifted – time hasn’t dated the movie at all, perhaps because it’s about something that’s simply timeless. On its surface, the movie (and the award-winning play from which the movie was adapted) is about Shirley Bradshaw, a middle-aged housewife living a stagnant, loveless life, and the choices she makes during a two-week vacation in Greece. But at its core, it’s about remembering who we really are – and reminding us that in every moment, the choice to be who we really are is always there, no matter what conventional wisdom might dictate. And I always feel so good when the movie is over; my dreams become real again, alive, beckoning. Everything shimmers with the brightness of possibility. “I’ve fallen in love with the idea of living”, Shirley says, and that’s what this movie does for me, and a little bit more – it reminds me to fall in love with myself, with the me I really am. It’s the same feeling I get after reading an Elizabeth Berg novel. Have you watched Shirley Valentine, either the movie or the play? What are some of your favorite “comfort movies”? This entry was posted in Movies and tagged comfort movies on February 6, 2010 by Belle Wong. I am not really a film person (I watch crime fiction now and then, but not much else). I have thought about reading the novel, though, as it is written by Willy Russell. I have read his drama, Educating Rita, in some of my classes, and also shown them the film. If you don´t know it, I can recommend it. .-= Dorte H´s last blog ..Anne Holt, 1222 (2008) =-. I’m not much of a movie person either, but occasionally I’ll feel like watching something. I haven’t watched Educating Rita yet – I’ll have to put that on my list! .-= rhapsodyinbooks´s last blog ..Review of “A Dog At Sea” by J. F. Englert =-. I don’t think I’ve even heard of this before. I’m glad you seem to like it so much though! 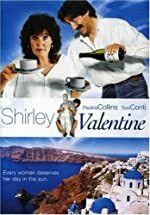 I do like Shirley Valentine too – it’s so funny at the beginning and it’s one of the few movies where having someone talk to themselves actually works. I always laugh about the vegetarian dog and how she feeds it her husband’s steak. One of my favourite comfort films is (don’t laugh) Clueless – it’s quite wrong for someone in her 40’s to enjoy it (it’s aimed at teenagers) but it is funny and based (loosely) on Jane Austen’s Emma and is, in its way, about the same things you mention – being true to one’s self etc. Another great comfort/feel good movie is Field of Dreams with Kevin Costner – talk about following your dreams. .-= Bernadette in Australia´s last blog ..Crime Fiction Alphabet – P is for Postmortem =-. I have never seen this movie but it sounds like one I would enjoy immensely! .-= Kathleen´s last blog ..Look What I got for $2.25 – Part II =-. This sounds fantastic — and just like something I would love to watch with my mom and sister! Even the scenery on the poster gets me. Definitely adding it to my Netflix queue! My favorite “comfort” movies, the ones I can watch over and over again, include “Becoming Jane,” “13 Going on 30,” “Sleepless In Seattle” and “You’ve Got Mail.” I probably know all of them by heart, but they never get old! .-= Meg´s last blog ..Book review: ‘When She Flew’ by Jennie Shortridge =-. I am netflixing this right now! I don’t think I’ve ever heard of it but sounds perfect for me. Thanks! .-= Care´s last blog ..The Princess Bride =-. I really love this film & I need to do a monologue for my a level drama course & I thought of the beginning of this film straight away. Does anybody know where I can find the script for the first scene free online?